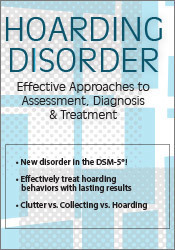 Hoarding is now classified as a real, full-blown diagnosis in the DSM-5®. It is a complex disorder that isn’t resolved with a forced cleanout like you see on television, but with customized treatment strategies for each individual. Join hoarding expert, Jennifer Sampson, PhD, LMFT, as she shows you how to get inside the mind of someone with hoarding disorder. You will learn the potential health risks, co-morbid disorders, and emotional challenges associated with hoarding. Dr. Sampson will give you strategies to properly assess and diagnose hoarding, conduct home visits and how to establish a collaborative network with other related professionals. This workshop is designed to give you the assessment and treatment strategies you need to help your client move forward and live a healthy, uncluttered life. Dr. Sampson will use case studies, client stories, and respectful humor that provide an outlet for this difficult topic. $50 off when you buy today! Offer expires Tuesday, 3-24-15, 11:59 p.m. (Central Time). Not valid on previous purchases or combined with other discounts.